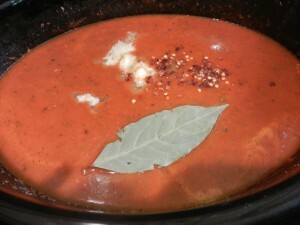 After making a batch of rotisserie chicken stock, I decided to use it as the base for a homemade tomato soup. I combined and tweaked this recipe from Pinterest with a recipe from Sara Foster’s Southern Kitchen and came up with a delicious and healthy tomato soup. The best thing about this soup is that it can be assembled in a matter of minutes and left in the crock pot all day. Let me say that although an immersion blender is not necessary for all soups, I do think it is with this one. Of course, you can use a blender to emulsify soups, but that is a HUGE pain in the neck. After trying that once or twice, I went straight to amazon.com and bought a wonderful KitchenAid immersion blender that I LOVE! I was going to link to it on amazon, but I saw that it is out of stock. For the soup, I used 3 different variations of tomatoes: TFM (The Fresh Market) pizza sauce, Del Monte organic diced, and Tuttorosso crushed tomatoes with basil. Each lends its own flavor and consistency to the soup. I used half a bag of fresh baby spinach. If I’d had fresh basil on hand, I would have used it instead (and I know the soup would have been over the top with fresh basil). Heat butter and evoo until hot; sautÃ© onion until translucent. Add garlic at the end. 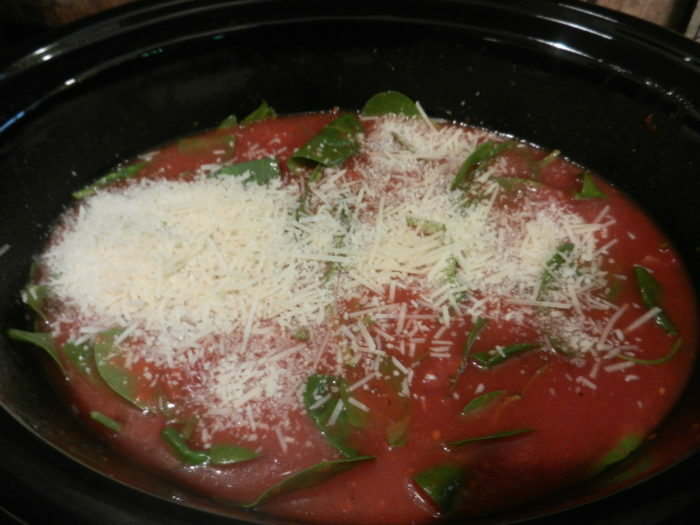 Put all ingredients (except bay leaves, parmesan and goat cheese) into crock pot on low. Using an immersion blender, blend the mixture until spinach is emulsified and all is a uniform consistency. Add the bay leaves and cheeses. Cook on low 5-7 hours. Garnish with goat cheese and shredded basil. Serve with crusty bread and a good Caesar salad. This soup was fabulous, but I know it would have been much more so if I’d had fresh basil. I will make sure I have that on hand next time.